Maria Williams's Blog » Are You Ready to Win an Art Print? It’s been a nice year and I am very happy with the support received from all of you. As a thank you here is an Art Print giveaway! I am planning to have various giveaways during this holiday season of 2011 and this is the first one! This week’s giveaway is for a print of “The Birch Tree Road”, the artwork size is approximately 7.5″ X 9.5″ and the matted size is 11″ X 14″. The mat color is blue. To enter, send me an email to mwilliams@marglezartstudio.com with the subject “Birch Tree Road Art Print” and include your full name in the message. The winner will be chosen randomly on Friday November 11th, 2011. Last day for entry is Thursday November 10, 2011 midnight EST. Only one entry per person. The winner will be notified on Friday (by email and the name will be posted on this page) and will have 72 hours to reply with postal address for mailing. If a reply is not received by then, another winner will be drawn from the list. The art print will be sent to the winner by First Class US Mail. Thank you for participating and your support! The winner for this giveaway was randomly selected. And the winner is Amber Thomas. 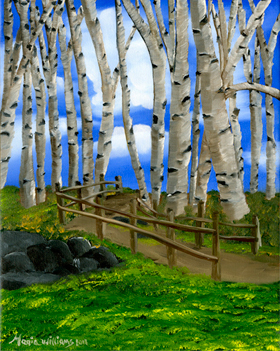 Congratulations to Amber Thomas who won the “Birch Tree Road” Art print. Stay tuned for future giveaways! 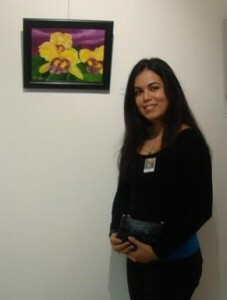 Visit my Facebook Fan Page for information about my art, events, giveaways, paintings progress and more! Ha sido un año excelente y estoy muy contenta con el apoyo recibido. Como muestra de apreciacion estare sorteando una impresion de pintura.